Below you can find more detailed reading and resources not included in the above text. Understanding the difference between redesigning and realigning can result in happier clients who are better reaching their website goals.There are times when redesigns are appropriate, and there are other times when realignments are appropriate. It all depends on how the client’s current site is working for them, and what their goals are. Redesigning a freelance website is an exercise in masochism. There are no colleagues or an umbrella corporation to share the pain: It’s just you. These glossaries are also especially useful for those of you who are just getting started in the online business world. By understanding that basics of the core materials that make up whatever it is you are getting into, you will be able to have a better understanding of what’s going on in your industry, as well as be able to learn faster. This article covers a brief overview on how to plan, execute and how to find the perfect timing for a redesign. Robert Hartland is a professional designer and photographer with over seven years of experience. He has worked on projects for top brands that include corporate identities, custom catalogs, trade show graphics, image manipulation, animation and website creation/management. He constantly pulls different elements he has learned, to use them to perfect a project, and accepts freelance work through his portfolio website Aether Design. Very well written and detailed article, great! A very useful (and detailed!) article – thanks for posting. This is great stuff! I am actualy looking forward to redesigning my website now! Before reading this article it was one big obstacle that had to be overcome first. Thanks!! Well-done! You completed a web design degree course here. You are among the design followers disputing the fact that school is a rip off in web designing. Your post is informative and educational. Thank you all for the great feedback. The idea was to deliver enough information so that all of the information you needed would be at your fingertips and all you would have to do is plan your own strategy. 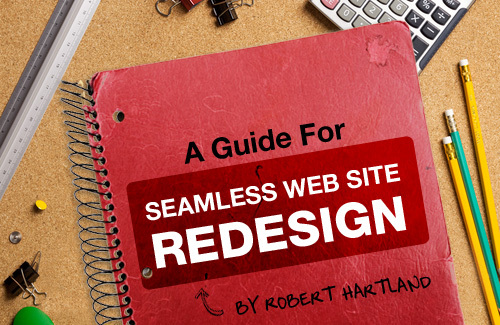 Really nice article about website Redesign….Thanks for Sharing..
Website design can make or break your site. A site needs to be eye pleasing, not too busy, and functional. There also needs to be pertinent information, but not too much as in today’s world, people are too busy to spend time reading information. Great article about website redesign, very detailed I picked up quite a few techniques. Excellent article, comprehensive. Thanks for the share.